Honor Malaysia fans who are waiting in anticipation for the company's first smartphone to feature a hole punch camera need not wait long. Following the global launch in Paris on Jan 22, the View20 will officially be on sale in Malaysia starting Jan 26. A special roadshow will commence from Jan 23 to 27, 2019. Spanning across five days, the roadshow at [email protected] 1 Utama Shopping Centre is said to be Honor's largest to date. The Honor View20 is available in two variants in Malaysia – the 8+256GB version that comes in an exclusive Phantom Blue color, and the 6+128GB version in sophisticated Midnight Black and stylish Sapphire Blue colors. Though no official price has been announced yet, do stay tune as DNA attends the global launch in Paris for more news. The all-new and chic Honor Watch Magic will also make its first appearance in Malaysia along the Honor View20. In fact, Malaysia is one of the first countries to welcome both revolutionary gadgets after its official launch in Paris. One of the lightest smartwatches ever at 0.0325 kg, the HONOR Watch Magic boasts a resolution of 390 x 390 pixels at 326 PPI in its 1.2-inch AMOLED touchscreen to offer a truly HD experience, even on a smartwatch! 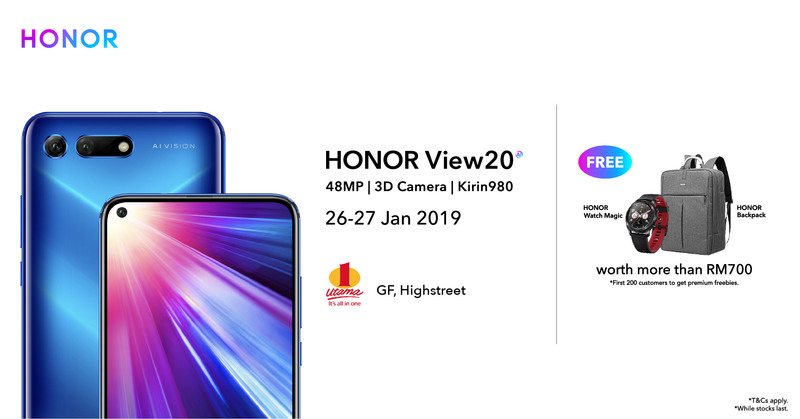 Customers who have had their eyes on the Honor View20 are in for a treat as early birds will receive premium free gifts worth over US$170 (RM 700) for purchases made during the roadshow on the 26th to the 27th of January. For the first 200 customers will receive one Honor Watch Magic and an Honor Backpack together with their new View20. The following 800 customers will receive a free Honor Band 4 and an Honor backpack. Honor Malaysia has also partnered with telco Maxis during that period to offer customers a chance to purchase the View20 through a two-year, US$38 (RM158) per month Maxis plan at just RM1 and receive free gifts too. Take note that this will only be available at the Maxis Centre at the New Wing of 1 Utama. The Honor View20 isn't the only start of the show during the roadshow as the company will also be offering its recently launched Honor 10 Lite at the roadshow. The classy Shiny Red and sleek ?Saphhire Blue variants will be present too, priced at US$194 (RM799). The first 1,000 customers stand to receive gifts worth US$46 (RM188). This would include one free Honor Band 4 running fitness band, a limited edition Honor water bottle and an air purifier. For more information on the launch of the Honor View20, the 1 Utama roadshow, or on Honor Malaysia, please visit Honor official e-commerce website and information portal at http://hihonor.com/my, or drop by their official Facebook page at https://www.facebook.com/HonorMY/ for other exciting updates.